The beach can provide a beautiful backdrop for your wedding but there are many details you will want to remember before you say “I do” at the ocean’s edge. Check the tides- Before you set a time for your wedding, check a local tide chart to make sure there will be enough sand for you to stand on during the ceremony. In places like St. Simons Island, the tide can completely cover the beach during high tide which would make a beach wedding impossible at certain times of the day. Do you need a permit?- Some towns require you to have a permit to get married on the beach. Some require you to reserve a specific space on the beach and in some areas, you can just walk right out and get married! Make sure you do your research and find out if you need a permit or to reserve a specific part of the beach. The last thing you want is the local authorities crashing your beach wedding! Provide sunscreen for your guests- You may think that your guests will automatically wear or bring sunscreen, but the reality is that most of them will not. As a courtesy (and to prevent your guests from turning into lobsters), set up a sunscreen station where your guests can apply sunscreen. You may also want to provide some fun sunglasses for those who forgot to bring theirs! Your guests will appreciate it. And while we are on the subject of sunscreen, make sure you and your bridal party have applied an ample amount as well. Offer refreshments- As a courtesy to your guests, especially on a hot day it is a good idea to offer some cool refreshments before and after the ceremony. Fruit infused water, sweet tea and lemonade are just a few that you may want to consider offering. 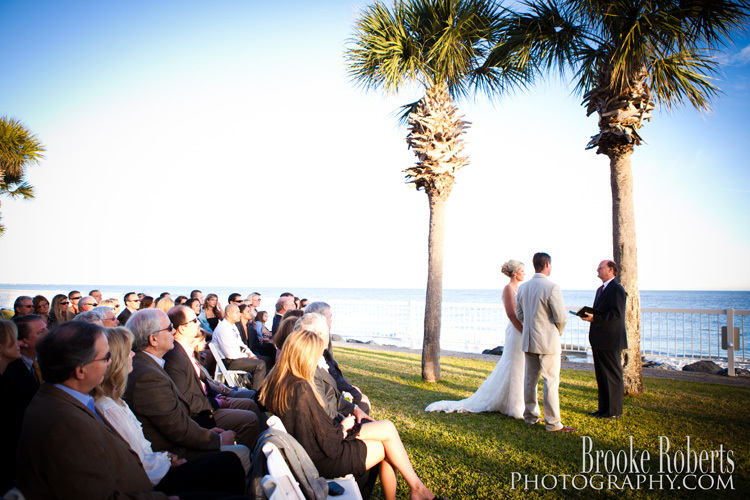 For more information about planning your beach wedding, visit our website. This entry was posted on Thursday, February 12th, 2015 at 11:39 pm	and is filed under Weddings. You can follow any responses to this entry through the RSS 2.0 feed. Responses are currently closed, but you can trackback from your own site.